In 1985 Racal chairman Ernest Harrison and Gerry Whent launched Racal Vodafone, the UK's first public mobile phone network, to commercialise military communications knowhow. Before then, 'carphones' had been exotic devices restricted to the heads of global corporations, the military and espionage chiefs. But Vodafone's first call was famously made by a comedian, Eric Morecambe. This democratisation of a high-tech status symbol struck a chord with punters, and by the late 1980s Racal Telecom (owner of the Vodafone brand) was worth more than its parent company. But it was 1991's demerger that really started the firm's rise. 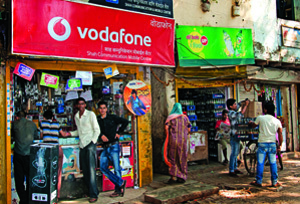 Vodafone embarked on a decade-long boom, moving into Africa and Asia and across Europe. In 1999 it bought US oppo AirTouch to become the largest mobile operator in the world. But it was the swashbuckling hostile takeover of Germany's Mannesmann for £112bn in 2000 that cemented Vodafone's hero status in the City as a corporate raider. By the mid noughties, Vodafone was no longer the feisty young upstart and competition from rivals offering mobile, landline, broadband and even pay-TV in one handy package was on the up. But despite the risk of mid-life crisis, Vodafone continued to spread across the globe, buying Turkey's Telsim for £2.6bn and Essar in India for £5.5bn and setting up US joint-venture Verizon Wireless in 1999. A new CEO at Vodafone is a big deal - the firm has only had four. The last regime change was in 2008, when Vittorio Colao took over. A former investment banker, he caused consternation by moving the group HQ from Newbury to west London. But his tenure will be defined by what he does with Verizon. Selling it could reap $90bn but would result in a huge tax bill. An all-share merger could limit that liability - as could a joint takeover of Vodafone itself, such as the £161bn effort rumoured to have been discussed by Verizon and AT&T recently. Such a deal could be lucrative for shareholders, but might also result in Vodafone itself being split up and hived off - an ignominious fate. Tax. Vodafone was getting it in the neck from protestors long before they had cottoned on to Starbucks or Amazon, over claims that it exploits tax havens and has avoided paying HMRC a £6bn bill dating back to the Essar deal of 2006. Egypt is another sore point - the firm's reputation took a beating after pro-Mubarek texts were sent to customers there during the 2011 uprising.